The discipline of marketing is evolving rapidly. With the shift in technologies that help marketers manage their day-to-day responsibilities in different ways, the expectations for marketers have also shifted. As you’d probably imagine, the team structures, skill sets and resultant salaries to support these new expectations have shifted as well. We recently updated an infographic on the cost of running a marketing team. So, in this post I’ll breakdown how marketing salaries and team structure have changed since we first published the asset in 2014. And some thoughts on why these changes took place. About ten years ago, MarTech companies began creating technology categories (marketing automation, content management, engagement platforms, ABM, etc.) with a laser focus on empowering and scaling marketing functions. Great for marketers, but it created confusion in the market with buyers. Many people invested in MarTech like “Marketing Automation” never expecting to incur the level of investment in people and process needed to ensure the technology’s success. 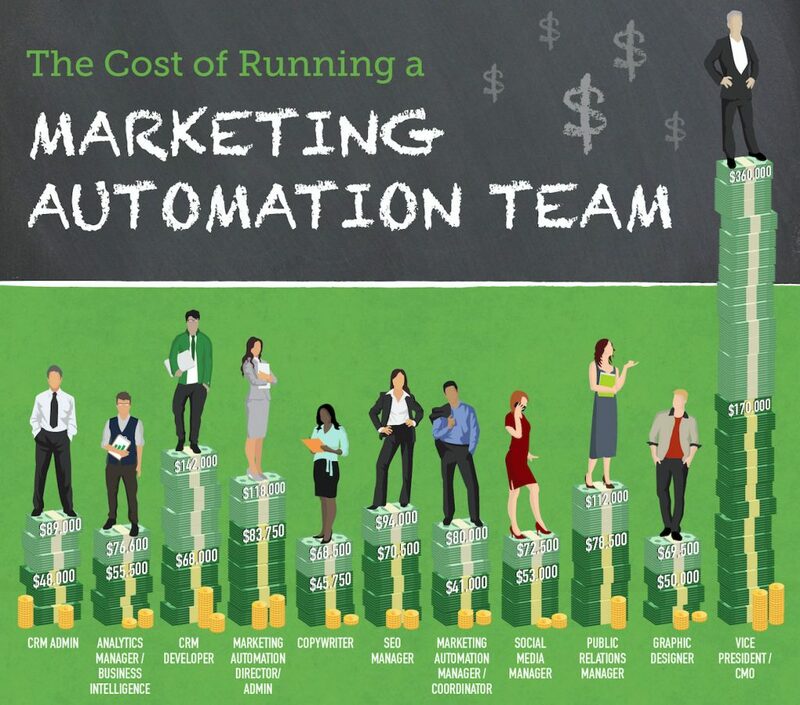 In 2014, we first published our “Cost of Running a Marketing Automation Team” infographic. It was very popular, but also slightly controversial. The “marketing automation” part seemed to generate the most chatter. “Why would you include jobs like graphic design and PR in a marketing automation team?” people asked. Our perspective was that marketing automation could never live in a silo. Without designers and strategy, marketing automation wouldn’t be worth the code in which it’s written. We’ve always seen marketing automation as a software category–a technology to enable people and process. Watching the term “Marketing Automation” shift in market perception over the past five years has been fascinating. Marketo, once content to be a marketing automation platform, rebranded to an “Engagement Platform” a while back. I’m still waiting for someone to explain WTF an “Engagement Platform” is. And consumers have changed, too. Interest in a term like marketing automation peaked in popularity around October 2017 (graph below). When we looked at the related search terms for people engaged in “Marketing Automation” searches, we found the majority of the terms related to products. This alludes to an association of the term marketing automation with platforms to DO something. 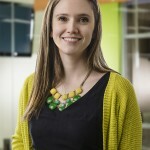 Marketing automation = technology. Recently however, “marketing automation” has fallen back to search levels from 2014. Our clients – and the market in general – have gradually stopped talking as much about technology as the silver bullet (much to SaaS’s chagrin and certainly some SaaS companies are still promoting the silver bullet myth) and have started talking about the roles of the people who manage those technologies as the actual drivers of change. As “Marketing Automation” search terms decline, there’s a rise in “Marketing Operations” of about 75%. This search query data combined with the anecdotal sentiments of our clients and industry insiders alludes to something compelling happening within the marketing discipline: a new respect for the people portion of people, process and technology. Most of the secondary search terms associated to marketing operations are not platform or product-specific, but rather around salaries and training. Here was the graphic from 2014 through last week. For the most part we were able to keep the job titles apples to apples, with two big exceptions. Originally, we had a “Marketing Automation Director/Admin” and a “Marketing Automation Manager/Coordinator.” As marketing technology matured, so too did the roles to support the platforms. People quickly realized that staffing for a single resource to manage the marketing automation platform wasn’t quite good enough. Marketing departments ran into a lot of issues with siloed marketing automation people, because MarTech, in order to truly be effective and transformative, must integrate and touch a lot of other systems. Thus, the skill set for marketers in this area matured from simply understanding marketing automation to requiring and the understanding of many technologies, including websites, basic HTML, CMS, payment portals and CRMs. And the solution adopted by many organizations was a role called Marketing Operations. We’ve reflected this shift by replacing both of the marketing automation job titles with the overarching “Marketing Ops” job. Marketing operations as a role was quickly adopted, especially by organizations with sales operations counterparts. On the forefront of this shift, MarketingOps.com launched. They performed a study on salaries in the space and it was the sole driver for the updated column for the role. Take a look at the full report here. I believe not having a middle-manager listed in the salaries was a miss. Someone really must be between the VP/CMO and the tactical resources on the rest of the list. And so, we added this role. Because we’re working with a few variables, I’ll try to keep it as simple as possible. Each title has a low average and a high average. Let’s talk about all the jobs where either (and both) were higher. Only one role saw increases in both the low and high end of salaries: Analytics Manager/Business Intelligence. This is another one of those jobs that can be a little challenging to keep consistent over the years, especially five of them! But I also see why the increased investment is necessary with this job. There’s more data than ever and finding someone who can actually pull insights from that data is truly challenging. Takeaway: The differences here aren’t dramatic. I think CRMs, like Salesforce, have done a great job scaling education and certifications for their product. The harm in that for the role is that more people are qualified and as basic economics dictates as the prevalence of the skill set increases and scarcity decreases, the price point follows. Therefore, on the lower end, you’re likely getting more junior resources for cheaper. And on the higher end, you’re paying more for the experience. Takeaway: Copywriting has become much more productized over the past five years. With sites like Upwork connecting freelancers to people with creative projects or content management systems creating copywriting marketplaces like Clearvoice, almost anyone can claim to be a copywriter. And so, the slight decrease in low salaries, again, to me indicates more junior people in the role. Meanwhile, the large increase in the high-end of the salary spectrum again indicates that those talented people who really can wield the written word in a way that excites and inspires customers will be monetarily rewarded for the skill. Takeaway: SEO is one of those functions that for the past decade has consistently been a black box. As Google continues to adjust their algorithm to reflect what users actually want to see in search, SEO specialists have had to transform from technical hackers to content marketing wizards. Like copy or CRM administration, when you have an amazing SEO person, it shows, and it feels markedly different. When you have a poor one, who simply drops backlinks in other blogs’ comments section, they’re worth less than the $58,000 you’d pay. Takeaway: The number of recent college grads I speak with who want to go “into social media marketing” is staggering. For every 100 of them I hear say those words, I get one person who is interested in email marketing or digital ads or SEO or anything else. Recent college grads have saturated and completely brought down the low end of this profession. But again, if you can find a seasoned social marketer who knows that engaging influencers is the key, not just posting updates all day, they’re worth almost six figures. This role is particularly interesting because PR was once siloed – write me a release and pitch a reporter. Today, the good ones are participating in the overall content strategy – bringing things like video, design and content marketing to the table. Which means that they have to be more engrained in the day-to-day of the overall marketing efforts. The decrease is evident that unless your PR person can step up and support the marketing-driven goals, they aren’t going to give you a true ROI. The increase shows that those that know their industry and the right strategies to support it, are worth a little more dough. Takeaway: Again, I believe college kids are to blame for this. They’re saturating the market with cheap, pretty good labor. This is another area that is increasingly losing viability. As tools like Shutterstock make editing and adjusting images more turnkey and easier for plain ole marketers to do, without the knowledge of Photoshop or other creative suite products, trained graphic designers become less important. Also, finding a designer who understand the business function of design is very challenging. So, like the other roles where I’ve said, if you can find an amazing person, they’re worth the high-end salary. The only role in this section is the CRM developer and with a high-end decrease of just $1,000, it’s almost not worth talking about. But, the fact that on the low end, the salary increased from $68,000 to $81,000, that’s worth chatting through quickly. Developers in general are NOT keeping up with demand. A developer who can write code in a CRM is likely to be well positioned to write other types of code. And even with the focus on code camps and education in STEM, this area is still completely depleted. So, it’s driving the low-end salaries higher. Why is the high-end stagnant? I honestly don’t know. If you have ideas, comment below! Only the big boss!?!? The VP/CMO role is the only role where we’re seeing a decrease at both the high and low end. To be honest, I think that’s a product of the data. It’s just too off! I assume the CMO salaries from 2014 included stock options or bonuses and this year’s data is solely salaries. Or maybe, this aligns to the lack of ROI companies are experiencing with marketing and the lack of tenure for CMOs. Who Knows?! At any rate, to see the full infographic updated, click here.